Hi everybody! First post and i’m excited. I’ve been posting pictures of wines and other assorted booze on my facebook page for a bit and decided to start a blog. Recently caught the wine bug so still a wine noob. Love to listen and learn and looking forward in sharing with you all my drinking and food escapades! So, what am i drinking today? 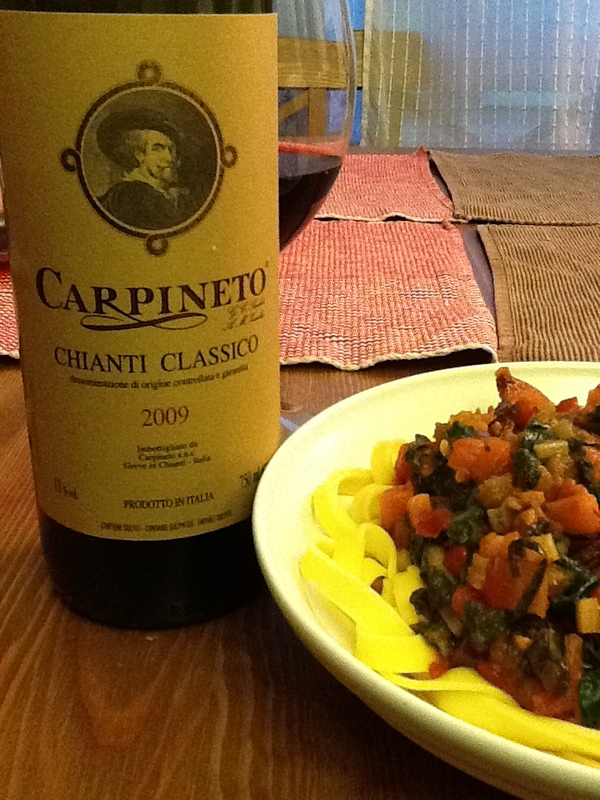 I’m a big fan of trying new things and this is my first experience with Chianti. Save you guys the googling, Chianti is a Tuscan red wine predominately comprised of Sangiovase (a very tasty grape indeed). Chianti itself covers a large part of Italy and Chianti Classico is almost within the centre of this region. This spicy number is 90% Sangiovase, 10% Canaolo and 13% alcohol. I decanted half of this wine cos I wanted to see how it would taste with some air and without (straight outta bottle), see how it develops over 24 hours and also, I can’t really drink a whole bottle in one night…or can I 🙂 ? I also made sure to drink this with something Italian – a tomato based pasta with fresh garden vegies, prawns and spicy chorizo. As a side note, the pasta was a major high five moment. Tasting the decanted wine (just over an hour in the decanter). Straight off the bat, earthy tones and a big nice semi ripe red fruit – think cherries. There is also a depth in this wine; it makes me feel that I’m going into a deep tunnel, into the earth with fruity goodness. Attack on the palate is straight up beautiful red fruits which slowly crescendos into a mid palate of excellence balance sweetness, acidity and tannins. Its light on the tongue, very easy drinking and a little bit dry, packed full of earthiness. Makes me think of dirt and fresh green capsicum skins. Finishes long and acidic and extremely pleasant. Tickle me impressed! Had to try some more, so I poured some straight out of the bottle. It’s a much punchier wine, nose is much deeper and almost black plums. There is also more heat/alco. Taste is richer, much more intense, still pleasent and more fruitier and the tannins comes across a tad bitter and thicker. I like both. Defiantly recommend trying some Chianti Classico if you haven’t already, either to drink now or to celler for a couple of years. Picked this bottle up for under $20 and I’d do it again. If anyone has any recommendations, please post and let me know! Till next time, and thanks for reading!